Collecting important original essays by librarians and archivists – all of whom are actively engaged in building digital collections – Digital Scholarship details both challenges and proven solutions in establishing, maintaining, and servicing digital scholarship in the humanities. This volume further explores the ways in which the humanities have benefited from the ability to digitize text and page images of historic documents, mine large corpuses of texts and other forms of records, and assemble widely dispersed cultural objects into common repositories for comparison and analysis--making new research questions and methods possible for the first time. 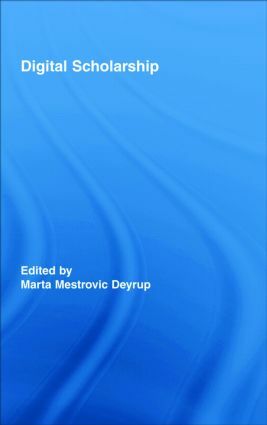 The ten notable scholars included in Digital Scholarship offer a balanced view of the strengths and weaknesses of various approaches to digitization, reporting both progress and problems, examining new business models, new forms of partnerships, and the new technologies and resources that make many more library and archival services available. Librarians and library staff everywhere will find Digital Scholarship an essential text for the modern library and an illuminating resource for anyone looking to understand the changing face of research in the electronic age. Marta Mestrovic Deyrup is Associate Professor/Catalog Coordinator at Seton Hall University Libraries. She has written and lectured extensively on scholarly communication and digital library projects. Marta received her Ph.D. from Columbia University and M.L.S. from Rutgers University.